We've combined the Science and Transportation Vintage Collections to bring you a fantastic collection of great public domain vintage clips that represents transportation and science of every kind. We've provided an mpeg version and DV version of each background for more flexibility when using the software of your choice. We've also included a preview interface so you can browse through all the choices before you transfer the background you want from the DVD. 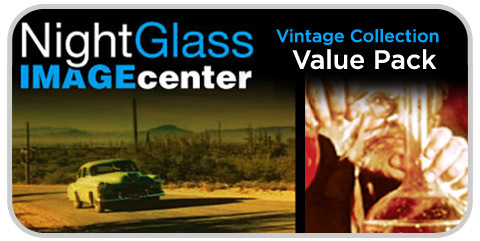 Come take a trip in the time machine with NightGlass Image Center and the Vintage Collection Value Pack.